PCA is a group of talented and enthusiastic engineers committed to delivering world-class turbomachinery designs. Our philosophy is to recruit the brightest and most accomplished engineers and to encourage them to develop their careers through innovative, challenging projects and by building their reputation on the world stage. We advance our technology via internally-funded R&D and by participation in multinational shared-funding projects, where we sit as an SME partner alongside industry-leading OEMs. Our office is based close to the city of Lincoln in the East Midlands of the United Kingdom which has its origins at the time of the Roman occupation of Britain. A cathedral was first built on the site in 1092, commissioned by William the Conquerer, and it became the tallest building in the world between 1400 and 1549. The remains of the Norman castle opposite the cathedral houses one of the copies of the Magna Carta, sealed by King John in 1215. Architecturally, the city is a blend of ancient and modern with its university located alongside the Brayford Pool which gave Lincoln its Roman name, Lindum Colonia. Although the county of Lincolnshire is mainly agricultural land, Lincoln has an interesting industrial heritage, including the development of the Mk 1 military tank during World War I. The city continues to be an important centre for the design and manufacture of turbomachinery, through Siemens Industrial Gas Turbines and Napier Turbochargers. The Royal Air Force is a major employer; Lincoln has two of the active bases in Lincolnshire at RAF Waddington and RAF Scampton. 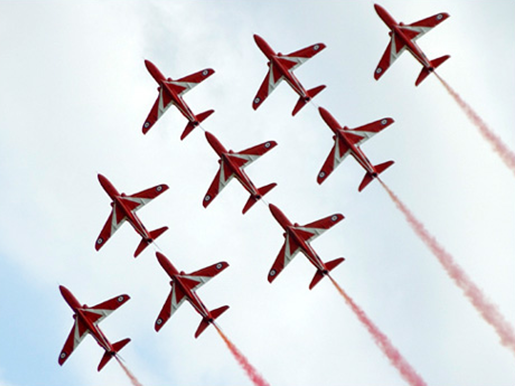 Waddington is home to the RAF Air Command's surveillance and reconnaissance fleet, while Scampton, famous for the 617 Dambusters Squadron in World War II, is presently home to the Red Arrows display team. PCA moved from the city centre in 2009 to a purpose built office in Nettleham, a picturesque village two miles north of the city, giving good accessibility to both staff and visitors and a quiet working environment. 1989 PCA begins operations with 3 founders. 1991 Turbomachinery design software marketing commences. Software used by clients in their in-house turbine and compressor designs. 1994 UK customer base is established and international customer base is expanding - customers include Rolls-Royce plc, ABB Turbo Systems, ABB Power Generation, and European Gas Turbines Ltd.
1996 PCA wins export award. 1997 Company has grown three times in staff and four times in turnover; North American and Japanese customer bases are established. 1999 PCA wins SMART award for the development of AMELIA - an unsteady aero-mechanical interaction system embodying PCA's unsteady finite element code FENELLA with CFX-TASCflow™. 2001 PCA enters a co-operation agreement with CFX, then a division of AEA Technology plc, combining the two companies' formidable strengths in turbomachinery design and CFD software systems for turbomachinery design and analysis. This cooperation, now between ANSYS® and PCA, still exists in even stronger form today. 2002 PCA expands its capability to include whole plant analysis, including gas turbine cycle analysis, steam plant analysis, and the diagnosis and resolution of operational performance issues in the turbomachinery components. 2004 In January PCA Engineers celebrated fifteen years in business, serving the turbomachinery fraternity with excellence in designs of compressors, turbines, fans, and blowers, and the supply of well-developed turbomachinery design software. Our client base now includes Rolls-Royce plc, two divisions of Siemens, Innogy, ABB, ALSTOM Power and many more. Between 2004 and 2007 PCA participated in several European Union funded consortia, including NEWAC, VITAL, and MOET, working with the leading manufacturers of aero-engines on advanced development of high performance compressors. 2009 PCA was awarded its first contract from a Chinese client.